Olive Ayhens, Urban Strata, 2004, oil on canvas, 84" x 58". Olive Ayhens is easily excused for eliciting nostalgia for the East Village of the 1980s. Her well-painted, deliberately unruly neo-expressionist scenes of New York often have several focal points, which enable Ayhens to capture the topsy-turvy life of the city. In Bristle Cones on the Balcony (2003), Ayhens focuses on the specific workings of urban and apartment life by including rooftop and behind-the-walls electrical cables. These are simply elements of a larger whole, as are the pigeons on one rooftop. Buildings and traffic patterns below appear helter-skelter, while a rickety-looking subway elevation heads off toward a bridge over a river. 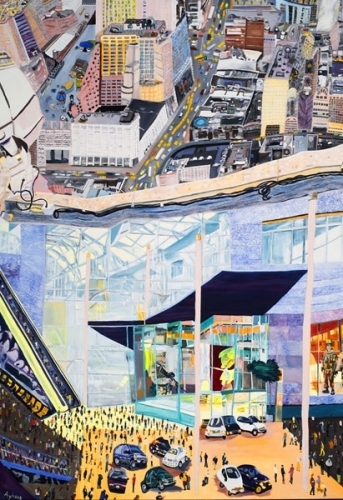 In Urban Strata (2004), the viewer's perspective is from both inside and outside the Auto Show at the Javits Center. Little caricatured people, funky cars, escalators, and camouflaged soldiers are seen through plate-glass windows. Airy interiors contain modernist exteriors. And a rooftop view of the city contains wires in the foreground and yellow cabs snaking up an avenue. It is a fun house and a tour de force. Turning away from the city's cacophony and intensity, Ayhens paints Dream Studio (2003), a single structure on a beach at night, lit from within. Its garage-type door opens up one whole wall to the outdoors, where there are chairs perched on the beach. The painting seems to ask, Doesn't the artist deserve such a refuge?